Braces are a common orthodontic treatment used to correct tooth alignment, giving your child a healthier, more beautiful smile. This treatment uses metal brackets and wires to achieve these goals. These brackets and wires are bonded to the front surfaces of their teeth and remain in place throughout the duration of their treatment. For braces to be effective, they need to be properly cared for Great Grins for KIDS - Oregon City can help. Brushing and flossing are two essential daily habits for eliminating plaque, bacteria, and other debris, preventing the development of serious issues such as cavities. With braces, however, both of these habits can be more difficult. Properly cleaning their braces and their teeth are essential and will require some extra effort. In addition to brushing their teeth in the morning and before bed, it is also highly recommended that your child brushes after every meal with braces. Your child should be using a soft-bristled toothbrush and fluoridated toothpaste. When brushing the front surfaces of the teeth, the head of the toothbrush should be angled against the brackets. This will help your child more effectively clean around the brackets. Several seconds should be spent on each tooth. Your child should also brush the backs of their teeth as well as the chewing surfaces. Flossing should still be done at least once a day. However, getting the floss behind the wires can be a bit challenging. A floss threader can be exceptionally helpful. After threading the floss, your child should clean between each tooth as well as under the wires and around the brackets. Make sure that your child does not forget behind their very last teeth. To protect their braces, your child will need to avoid eating certain foods. Foods that are hard, crunchy, sticky, and chewy can all cause significant issues. These include foods like crusty bread, whole apples, corn on the cob, hard candies, gummy candies, and ice can cause brackets to pop off or wires to bend or break. There are still plenty of foods your child can enjoy, including sliced apples, corn off of the cob, soft bread, yogurt, cheese, soft or ground meats, and more. If your child plays sports, a mouth guard is essential for protecting their mouth. However, your child cannot wear their normal mouth guard during the course of their orthodontic treatment. The mouth guard will not fit properly, which can increase their risk of injuries. Instead, we can custom create a special mouth guard that will accommodate their braces, providing them with the best possible protection. Your child may do everything right to take care of their braces, but sometimes emergencies can still happen. A bracket can pop off of a tooth, or a wire may come loose, bend, or even break. When a braces emergency occurs, it is important to schedule an appointment right away. The sooner care is sought, the less likely it is for your child to experience a delay in their orthodontic treatment. With proper care, braces are an effective treatment for helping your child to achieve a healthier, more beautiful smile. 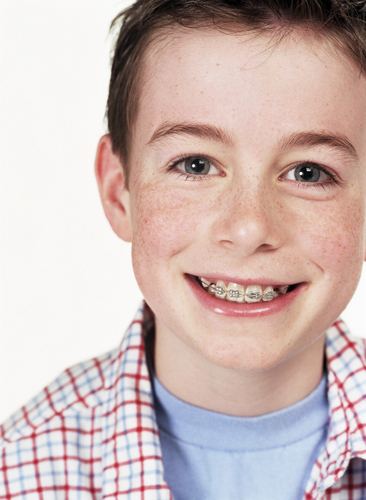 For more information on proper braces care, call Great Grins for KIDS - Oregon City today at 971-470-0045.